I have a new roommate…Surajit Atha.My new roommate has an old friend. K.D.The new roommate’s old friend has a roommate,Tehseen. And this new roommate’s old friend’s roommate has finished her graduation and has not found a job. Tired of living on credit ,she decided to go back home. Understandably KD and Atha wanted to have a “last” trip together. Several destinations were discussed and discarded before we finally hit on OHIO. Having already finished seeing all the states adjoining Virginia so far…we are venturing farther and farther out. Atha,by means of tempting,ordering and cajoling manage to get Subha and me excited enough and I roped in Seejo and Seejo roped in his friend and by the time we started we were a huge party. Ohio is a 7 hour journey by road. We started on Friday night,picked up Ashu and Seejo on the way and drove till Akron,OH. Ninad, ( my D.J S classmate) stays there in a HUGE house with 4 of his friends so we crashlanded at his place for the night. 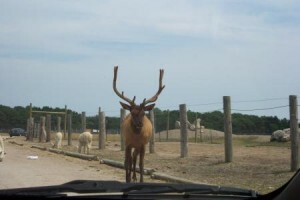 The main attraction in Ohio was an African Wildlife safari. When we planned it we were not sure how good it would prove to be and were apprehensive that it would just be an attraction for tiny tots.However it was quite worth a trip to Ohio. The place had a zoo kind of thing initially with a lot of exotic animals like the kangaroo, some wild monkeys, ocelots and warthogs and anteaters. The safari actually as a drive through were we drive through a mile or so in our cars and the animals are roaming wild. We could also feed the animals with a packet of food provided by the safari authorities. As soon as we entered the safari area .A huge eland (taller than our car) sauntered towards us. It was pretty amazing soon we were surrounded by llamas,elands and varieties of deer. We could roll our windows down and feed the animals while they slobbered all over our car. I fed some deers and enjoyed watching them jostle each other for the food. Next set of animlas ere the more exotic ones. zebras,camels giraffes and ostriches. It was pretty neat to watch ostriches and giraffes stick their long necks thru the window of the car to stare and at you and eat the food right off oyur hands. Tremendous experie nce for sure. We then went to a mystery spot in Ohio which “defies” gravity. It was similar to the stuff in San Franciso. bt the San jose one was much better presented and preserved. Ended the day by swimming/plying in the beach off lake Erie. We drove back to Pittsburgh at night and landed at Vrushali’s place for the night. The next day that is Sunday we went to sight see Pittsburgh. It is a beautiful city. Two rivers meet and join to form a thrid river right in the middle of the city. Hence there are about 435 bridges which crisscross the city and have earned it the nam of City of Bridges. We could view the entire landscape from a point called the Dunesque Incline. I will put some photographs up soon…. Reached home late night at 2 am.